Fresh catfish is as common around here as ground beef is everywhere else, so we tend to eat a lot of it all year round and especially during Lent. Cut into strips and deep fried is the most popular way of course, though it's also excellent baked and even stewed, but whenever I prepare it as a whole fillet I like to prepare it pan-fried. 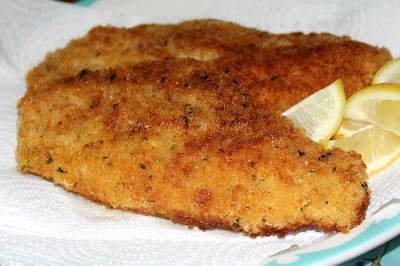 Panko makes for a nice and crunchy coating and I just love that stuff. So funny... I've been blogging long enough that I remember when panko was a luxury item and very hard to find - usually meaning a trip to a specialty store, and trust me when I say those are not common around here. Now you see it all over the blogs and these days you'll find it on pretty much any grocery market shelf, and for that, I'm a pretty happy gal! 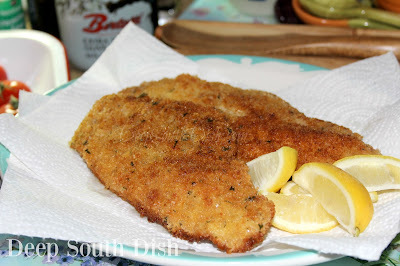 I love the ease of these crispy pan fried catfish and they are much less messy and time consuming than setting up the deep fryer. These seasonings and coatings will work with many firm-fleshed white fish - simply adjust your cooking time according to the thickness of the fillet. Here's how to make it. Rinse catfish and set aside. Heat oil in a large skillet over medium high heat. Set up 3 dredging stations, bowls, plates or sections of aluminum foil - I like to use pie plates for the coatings. In the first, combine the flour, salt, pepper, Creole or Cajun seasoning, Old Bay, paprika, onion and garlic powder. In the second, beat the eggs. In the last, put the panko and parsley. Dredge catfish in the flour mixture first. Then dip in the eggs and dredge in the panko; transfer to a plate and repeat for each fillet. Fry in hot oil, in batches if necessary, for about 3 to 4 minutes per side, depending on size, or until golden brown and cooked through. 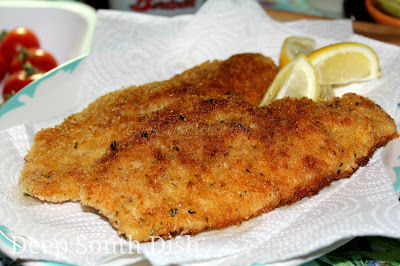 Drain on paper towels and serve with tartar sauce, lemon wedges and a side of greens is perfect. 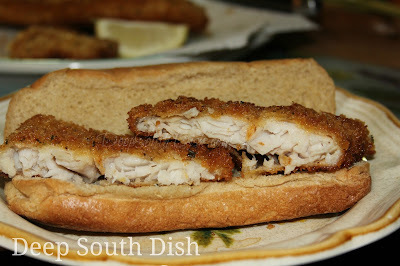 These catfish make the perfect taco or sandwich too by the way. The tender, flaky fish, against the crunchy coating, go fantastic with soft tortillas, po'boy bread, or a good soft roll. Yum, yum y'all - let's eat! Grab some more of my favorite fish recipes here on Pinterest! Rinse catfish and set aside. Heat oil in a large skillet over medium high heat. Set up 3 dredging stations (I use pie plates) and in the first combine the flour, salt, pepper, Creole or Cajun seasoning, Old Bay, paprika, onion and garlic powder. The second with the eggs, beaten and the last, the panko and parsley. Dredge catfish in the flour mixture, then the eggs and last the crumbs; transfer to a plate. Fry, in batches if necessary, 3 to 4 minutes per side, depending on size, or until golden brown and cooked through. Drain on paper towels and plate, serving with tartar sauce, lemon wedges and a vegetable, coleslaw or salad. A side of greens is perfect. Tip: Frozen catfish often has a muddy flavor to it. You may be able to counter that by purchasing only catfish from the U.S., removing any fat and/or "dark meat" that is present on the fillets and soaking them for 30 minutes at room temperature in a salt water or buttermilk brine. For 1 quart of water or buttermilk, use 1 tablespoon of salt. Add a tablespoon of hot sauce to your brine for a punch of flavor. It's hard to beat good ole fried catfish and your coating color looks just right. Mary, I have never had fried catfish. My mother never made it for our family so I never have either. I usually order the grilled catfish at Cracker Barrel and it is great. Your recipe looks delicious so if I can find some catfish in the stores I'll certainly try fixing it by your recipe. I don't get to Cracker Barrel often but I'm gonna have to see what theirs is like! Hope you get a chance to try this - but if you can't find catfish the coating will work on many other firm-fleshed fish too! And mac and cheese with stewed tomatoes and cornbread. It's not really too much more than that Linda! You can find find mine here towards the bottom of the recipe. Hope that helps!